The Next Generation Social Sciences in Africa program, launched in June 2011, responds to a shortage of experienced faculty in African higher education by providing fellowships to nurture the intellectual development and increase retention of early-career faculty in Ghana, Kenya, Nigeria, South Africa, Tanzania, and Uganda. Carnegie Corporation of New York funds three distinct competitive fellowship opportunities for early-career social science faculty of African academics working on peace, security and development issues: Doctoral dissertation research fellowship, Doctoral dissertation completion fellowship and Doctoral dissertation proposal fellowship. 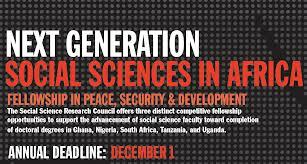 This current call, as outlined below, is for Next Generation Social Sciences in Africa: Doctoral Dissertation Research Fellowship. To be eligible for the US$15,000 dissertation research fellowship, applicants must have an approved dissertation proposal but will not yet have undertaken research of nine months or more. To be more eligible for the US$15, 000 dissertation completion fellowship, applicants must be in the final year of writing and have completed at least one dissertation chapter. To be eligible for the US$3,000 dissertation proposal fellowship, applicants must be admitted to a graduate program but have yet to undertake dissertation research. Strong proposals will offer clear and concise descriptions of the project and its significance. Proposals should display a thorough knowledge of the relevant social science literature that applicants will engage and the methodologies relevant to the project. In addition, applicants must demonstrate that all proposed activities are feasible and can be completed in a timely manner. All proposals will be evaluated for these criteria by an independent, international committee of leading scholars from a range of social science disciplines. The fellowships support dissertations and research on peace, security and development topics. The program assists fellows to develop research opportunities and skills, obtain doctoral degrees, and participate in robust research communities. Toward this end, the project features a thematic focus in order to renew basic research agendas addressing peace, security, and development topics as well as strengthen interdisciplinary social science research capacity on these issues. The doctoral dissertation research fellowship supports 6-12 months of dissertation research costs of up to US$15,000 on a topic related to peace, security, and development. The doctoral dissertation proposal fellowship supports short-term research costs of up to US$3,000 to develop a doctoral dissertation proposal. All applications must be submitted using the online application portal. Please visit the official website (link to it is below) for complete information on how to apply. Funded by Carnegie Corporation of New York, this project offers a replicable model at scale and complements foundation initiatives to develop and strengthen the next generation of African scholars. The Social Science Research Council (SSRC) is a U.S.-based independent nonprofit organization dedicated to advancing research in the social sciences and related disciplines. Established in Manhattan in 1923, it today maintains a headquarters in Brooklyn Heights, and small regional offices in other parts of the world on an as-needed basis. The SSRC offers several fellowships to young researchers in the social sciences and related disciplines, mostly for overseas fieldwork.